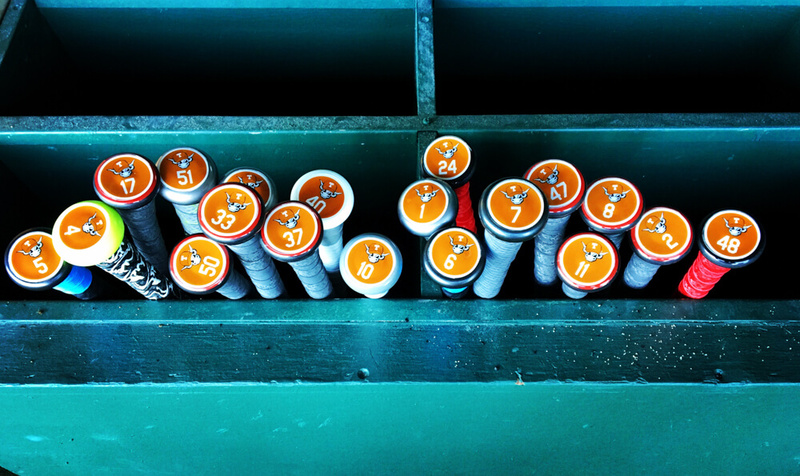 Editor’s Note: Being that we are “What Pros Wear,” we don’t really talk much about metal bats. It always feels like we are missing that piece, so I asked our bat expert Christian to give us his best metal bats, from T-Ball all the way through BBCOR. Christian is a no-nonsense kind of guy, and these are just the facts. If you’re in the market, give these a good look. This bat will feature a 7/8 inch handle with a traditional knob. It is a one-piece made of Alloy and will come in a -12.5 length to weight ratio. The barrel diameter is 2.25 inches. The 917 can be purchased here. The Maxum is a one-piece constructed of Composite material. The handle is thin 29/32 and has a -14 length to weight ratio. The barrel diameter is 2.25. The Maxum is available here. The Mako Beast Youth will come in a -11 weight ratio. It will have a 29/32 inch handle that also features ConneXion technology which will maximize energy transfer upon contact according to Easton. The barrel is 2 1/4 and will be controllable due to the balanced overall feel. The Mako Beast is being called the hottest bat ever because of its pop. The Youth Mako can be purchased here. The XL3 is an alloy one-piece extended barrel bat. Because the handle is a thin 29/32, combined with the elongated barrel it will generate increased bat speed. Even though the barrel is longer the feel will still be balanced. The XL3 will come in a -11 length to weight ratio. The barrel is great for younger players who are having trouble finding the sweet spot consistently. The XL3 is available for purchase here. The Velo is a one-piece balanced offering. According to Rawlings, the pOp 2.0 technology creates an enhanced sweet spot and adds more pop to an already easy swinging bat. Since it is a one-piece it will have a stiffer more responsive feel. The Velo can be purchased at this link. The Voodoo is a two-piece bat that offers an alloy 2 5/8 inch barrel that is very balanced and has a composite type handle. A key feature is the Low Pro End Cap that will increase feel and compression. The Voodoo Senior will have great trampoline effect as an aluminum two-piece and will be ready right out of the wrapper. The Voodoo can be purchased at this link. The 917 Prime is a three-piece composite bat. The 31/32 inch handle will come pre-wrapped in custom color lizard skin. The barrel is 2 5/8 inches and it will feel balanced through the zone. Louisville Slugger’s improved TRU3 technology reduces vibration and increases durability and feel. If you’re having trouble getting the bat through the zone or adjusting to off-speed pitches this is a great option. The 917 Prime can be purchased here. The Voodoo Insane is an end-loaded model. It is a hybrid model combining a composite handle and a 2 5/8 alloy barrel. According to Demarini, the combination of X14 alloy barrel and the enhanced D-fusion 2.0 handle will make this Voodoo stronger than ever. The end-load of the barrel will really help with bat speed as long as you can control it. The Voodoo Insane can be purchased here. *Note: Always make sure that the bats you are looking to purchase have league certification that aligns with the league you will be playing in.